How to Set Up a Connection in Windows 7? "Set Up a Connection - Internet, Wireless Router or Access Point, Dial-up?" Windows 7 makes it easy to set up a connection to an existing network as well as to a new peer-to-peer network, called a homegroup. So, whether you wish to connect to the Internet or setup network connection to other PCs, you need to setup the connection. 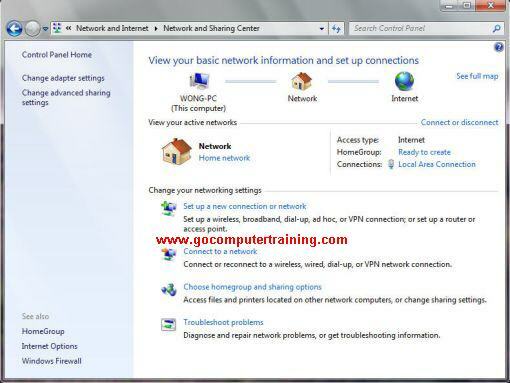 The following are the steps to setup different types of connections in Windows 7. From the Network and Sharing Center window, click the Set up a new connection or network link. * Connect to the Internet - It opens the Connect to the Internet dialog box, where you select the type of connection (wireless, broadband [PPPoE] or dialup) to use. Then, you need to give the information required for you to log on to the Internet service provider (ISP) or wireless network for the type of connection you choose. * Set up a new network - This option leads to a wizard that walks you through the steps of configuring a new wireless router or access point. * Connect to a workplace - This option opens the Connect to a Workplace dialog box, where you choose between using a VPN or dialup connection for connecting. If you click the Use My Internet Connection (VPN) button, a Connect to a Workplace dialog box opens, where you enter the Internet address and destination name you use to log on to the network at your workplace as provided by the network's administrator. If you click the Dial Directly button, a Connect to Workplace dialog box opens, where you enter the dialup information. 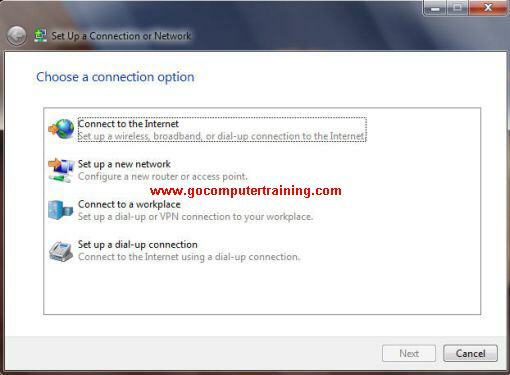 * Set up a dial-up connection - Using this option opens the Set Up a Dial-Up Connection dialog box, where you enter the dialup information for your ISP, including the phone number, username, and password. * Manually Connect to a Wireless Network - This option enables you to select a network that isn't automatically detected by the computer or create a new wireless connection by using a different wireless network adapter installed on your computer. Depending to the option that you choose, you need to follows the on-screen instructions to complete the setup process.